The Hermes Chaine D'ancre Diamond Necklace is a dazzling piece that provides sparkle and attracts attention from across the room. The glittering pendant appears to float from the chain, which adds mystique and interest. Although it is small in size, it makes an elegant impression. 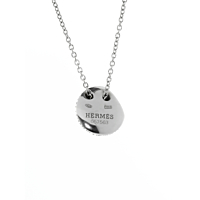 The Hermes motif is prominently featured on the side and blends seamlessly with the diamonds. This necklace is ideal for fancy occasions, but it can be worn everyday as well.